COLLECTIONS: Baillieu Library, Melbourne University, Australia; State Library of Queensland, Australia. Much of my work develops from the plastic I collect from the tide-lines of local beaches. My artist’s book Battalion is no exception. It consists of photographs of twelve plastic toy-soldiers washed up on Discovery Bay in southwest Victoria, with accompanying words selected from war poems of many cultures and times. The figures are extremely weathered as a result of their time in the elements. Some are headless or limbless; others are scarred or almost worn away. All are evocative of soldiers after some great battle. 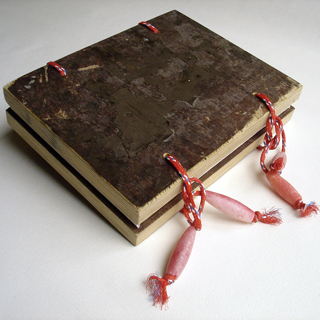 The physical construction of the book also incorporates beach-found materials: the cover of marine ply, the ties of fishing-ropes and lures.